Whilst new ROCOF measurement techniques can be developed in simulation or by using laboratory waveform generators, it is important that real electricity network waveforms are used to develop and test ROCOF instruments. The ROCOF project has undertaken a unique experiment to test ROCOF in a real electricity network which is derives a large amount of its energy from renewable sources. Bornholm Island is representative of how future energy network will behave in 2050 in order to meet the EU’s CO2 emissions targets. We have installed six waveform measurement units (WMU) at various electrically interesting locations around the island. One instrument is located on the island’s only interconnection with the Nordic Grid system and measures at the 60 kV levels. A second instrument is connected at 10 kV on the output of a wind farm. The remaining four instruments are at the low voltage 440 V level and comprise of the two main cities, a rural location and the LV side of the above wind park. 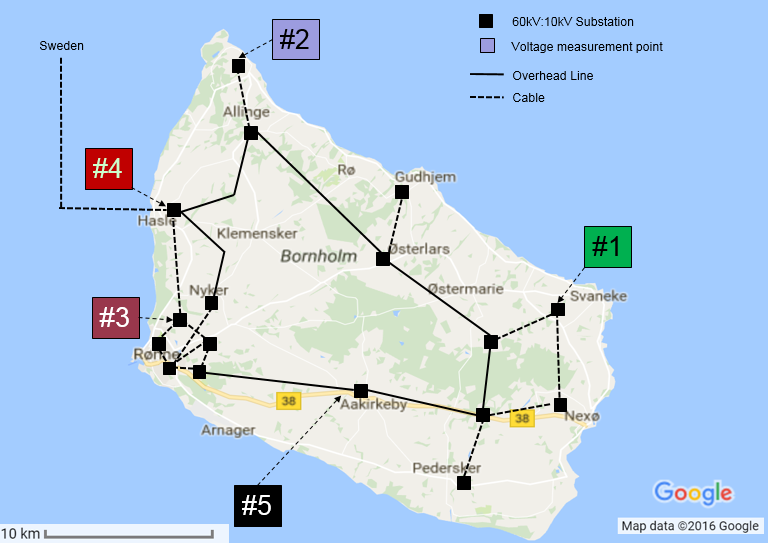 Bornholm Island 60 kV distribution network and WMU measurement sites. All instruments are equipped with GPS which allows accurate time stamping of their measurements. ROCOF algorithms run in real-time and can be configured for various update rates ranging from one reading every 20 ms (50 Hz cycle period) to one reading per 100 ms giving a trade-off of measurement time latency and noise averaging. The underlying sample rate is adjustable and has a maximum of 30 kS/s. When a ROCOF algorithm on any given instrument measures an absolute value above a preset threshold, a rolling buffer of raw waveform data before and after the trigger event is saved to the local hard disk. This data includes the three voltage and current phases together with detailed GPS timing information. This data can then be downloaded and examined. Data from a ROCOF trigger event is potentially of significant interest; it could be representative of a real ROCOF event which would be potentially more frequent on a low-inertia network such as Bornholm. Alternatively, it could be a false trigger caused by a power quality (PQ) disturbance or phase jump such as a switching transient, a voltage dip/swell, or unbalanced fault. Whichever the event, the response of the algorithm with its given configuration will provide valuable information on the limitations of ROCOF such as how PQ events can be rejected, whilst providing acceptable measurement update rates for real time power system protection. The ability to replay captured data through alternative algorithms and configurations will be highly advantageous to recommending new normative approaches to ROCOF measurements. 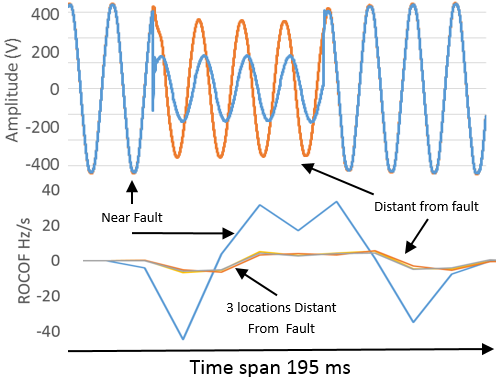 Simultaneous ROCOF measurements in multiple locations will also yield valuable information about the effects of different voltage levels and locations to the sensitivity of the measurement to spurious PQ events. An example of a ROCOF reading exceeding the threshold is shown in the figure. The captured waveform data in the top plot clearly shows a brief fault on the power system causing the voltage level to dip. The bottom plot shows the ROCOF measured around the island using the projects instruments which hear are updating every 20 ms (every mains cycle), near the fault the ROCOF is recorded at some 40 Hz/s more than sufficient to trip ROCOF relays and disconnect renewables from the grid. Top plot: phase L2 waveforms near and distant to a fault. Bottom plot: ROCOF as measured at the four locations. The question for researchers is does this represent a real ROCOF event or has the algorithm given a false result. Having access to the waveform data centred around events such as this allow the development of a detailed understanding of such events and facilitates the improvement of future ROCOF instruments. We are also working with other network operators who are sharing data from ROCOF events on their networks. We are building a library of these cases and we hope to publish this data as a resource for researchers, manufacturers and standards development organisations. This library will appear on the web pages in the near future and will be an extension to the existing NPL waveform library.